If you have a lot of products on your WooCommerce site, it can be difficult to create consistent, high-quality product pages. With a lot of settings, its easy to forget something. 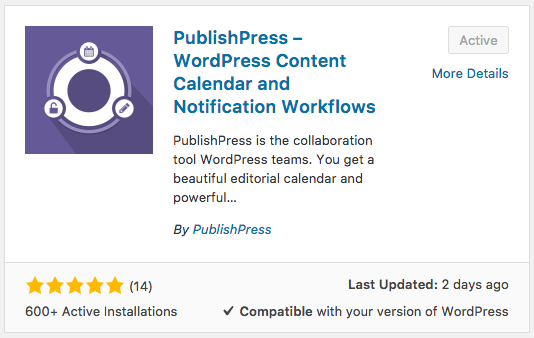 To make sure that all your WooCommerce pages meet your standards, we recommend the PublishPress plugin with the WooCommerce Checklist addon. Install the free PublishPress plugin. 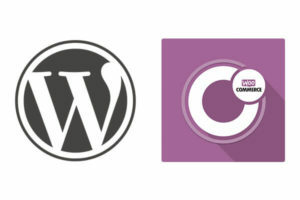 Buy and install the Content Checklist and the WooCommerce Checklist add-ons. Go to “PublishPress”, then “Settings”, then “Checklist”. Check the “Product” post type box. You can now choose all of your requirements for each WooCommerce product. You can choose the number of categories, tags, and words. You can decide which boxes people need to check. Disabled: Ignore this requirement entirely. Show a sidebar message (default): This simply shows the recommendation in the sidebar when writing a WordPress post. Show a pop-up message: This will display a pop-up with a warning message, but users can still publish. Prevent publishing: Users won’t be able to publish if this is not complete. 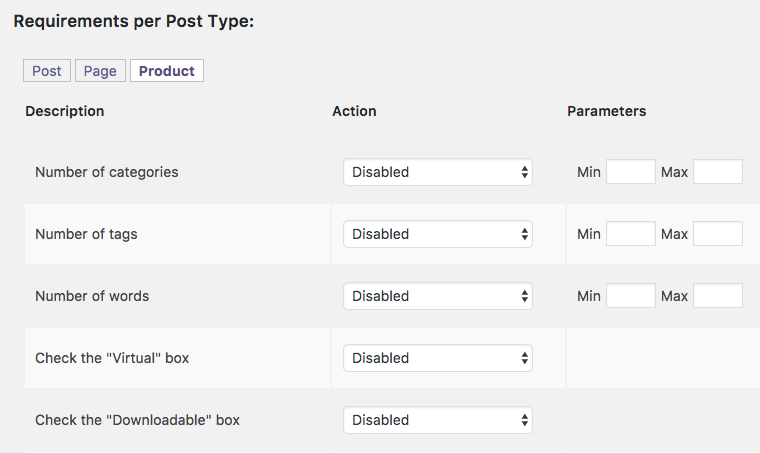 Go to edit a WooCommerce product, and check the new box in the right sidebar. Requirements that are complete have a green check. Requirement that are incomplete have a red X. As the store owner, you can make sure that every product has a price, a title and categories. You can make sure that all your products are marked as “Downloadable” or “Virtual”. 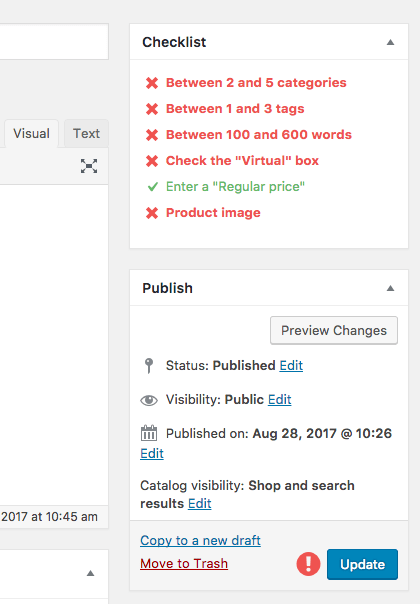 You can set a maximum and maximum number of words in WordPress for WooCommerce product descriptions. You can enforce a minimum and maximum number of tags and categories for products. If you want to, you can even create your own rules for your checklists. On a busy site, the WooCommerce Checklist can save you from making expensive data-entry mistakes.